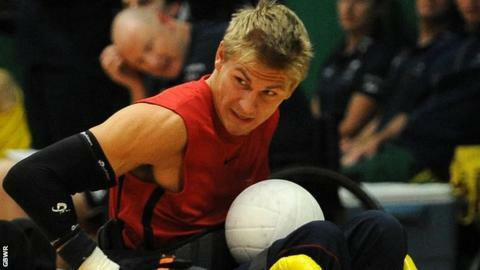 "Being selected to captain my team through the Paralympics is such an honour," he told BBC Radio Kent. "Going full circle from not being selected at Beijing and now being selected and appointed to captain the team is a big difference." Having finished fourth at the last two Paralympics, Brown backed his side to go all the way in London. "We're doing so well at the moment," he said. "Both internationally and through the squad itself, there's new ideas, new initiatives and the players themselves have so much to prove. "Some of them have only been in the squad for five minutes and they are still looking to reach their potential. "Everything is going in the right direction. It's exciting times for the team." Brown, who represents Kent Crusaders, says his current team-mates inspired him to take up the sport after he broke his neck in an accident in 2005. "Following my injury, I was in Stoke Mandeville hospital," he continued. "My physio took me down to watch a game of wheelchair rugby and from there on in, I was hooked. "There was a big difference between where the people were both mentally and physically in terms of their injuries to where I was. "I didn't really believe they had the sort of injury that I had sustained. "But looking at them on closer inspection I realised a lot were worse than mine. They really were the inspiration that kick-started the whole thing. "To be captain of the team that inspired me to make the most of things, I'm over the moon."